Notes: It's been a long while since I've read any Puzo, so I thought it time I give him another go. I've never been a huge fan of him, but have enjoyed his tales. This tale of gambling, the entertainment world and the publishing industry was apparently Puzo's favorite of his own works. Mini review: Wow. Just ... wow. This was simply awe-inspiring storytelling. They don't write them like this nowadays. This novel seriously makes me reevaluate my opinion of Puzo as an artist. I seem to have read somewhere he considered this his favorite of his novels, and I can understand why. The story starts off in one direction, then shifts quite early. 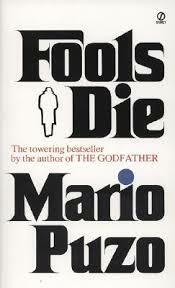 Normally I don't like it when writers do this, but Puzo does more than simply make it work. The tale spans roughly 15 to 20 years, from about 1950 to about 1970, with some mention of earlier events, though the author never gives exact dates and makes it not so easy to figure out how much time has passed. It's the little clues that give it away. Also, the story is centered around Vegas for the first half, then shifts to Hollywood for much of the second half, with the occasional jaunts to New York or Japan. This is not a mob book, though there are a few characters who operate on the edges of the mafia lifestyle. This novel says a lot about writing, and a lot about gambling, and a lot about the relationship between the sexes. Frankly, this novel says a lot about a lot of things. All of them interesting. And in the end, in the final pages, after all the running around and the adventures and the highs and the lows, it's actually quite the literary work. Yes, this is the type of novel that makes me, as a writer, more than a little jealous. It's also a novel for writers, which brought me more than a little enjoyment. What writers will be remembered 100 years from now? It's a question that comes up from time to time on blogs and various online forums. Sometimes it comes up at conferences and conventions, sometimes on Facebook, Twitter, or just between two writers talking. There's no way to know, of course, unless one is the Doctor, and everyone seems to have their own opinions. To some extent, one can look back a hundred years at the authors who were popular then and see if they are still popular today, then kind of guess if similar writers will remain popular in the future, but I say "kind of" and "to some extent" because that doesn't really work either. All we can do is make our opinions. And below are some of mine, with the author's name first, followed by my answer to the question. My thoughts on this are not based solely upon the quality of work of the author, nor only upon their sales numbers, but takes into consideration how well they resonate throughout the U.S. and world cultures at large. NO, which is funny because a couple of decades ago I would have say "yes"
So, there are my predictions concerning some of the better-known authors of today. It's only my opinion, not worth arguing over, and I freely admit my thoughts on the subject matter might change at some point. I'd be interested in seeing what others predict. Which D&D character am I? American Crossroads, a collection of five of my more literary short stories, has a new cover in the works. In the working version is above. This cover and a print edition should be available for readers sometime early next month. 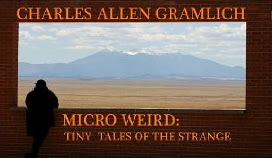 And thanks to author and professor Charles Gramlich for providing that fine blurb on my cover. Notes: This novel drew me in for a couple of reasons. First, the story is about people who can apparently travel back in time to try and make corrections in their own lives. That interested me. Second, the author has also released a concept album based upon the novel. He and his band The Sawg are responsible for the music. One can even download the album for free at the book and album's site. Mini review: I might have made this novel sound like science fiction, but it's really more metaphysical than that, sort of modern spiritual fantasy. Here a group of individuals who are tenuously linked through various events have the opportunity after their deaths to go back and look at their lives, with a chance to change some things. These changes then sort of create a parallel universe where the individual has a different life. I applaud the author for his outreaching here, for his study of life and death. The writing is pretty solid throughout, though I would have chopped at least 10,000, maybe 20,000, words from the novel, as it does get bogged down in a few places with some almost psychedelic scenery and some flashbacks that run on too long. The characters here are pretty strong, but two stood out above the others, the older couple of Sarah and Tobias, this pair having interesting and quite detailed lives. One interesting point is the novel is split into two sections, the first of events that happen in one world, the second of events playing out in a parallel universe. There are love stories to be found here, but also some tragedy. By the way, I checked out the music that goes with this story, and what I heard seemed like pretty cool material. Sort of '60s prog rock but with a modern electronic flavor. My epic fantasy novel City of Rogues is temporarily free once more in e-book form at all sites where it can be found, and it has also been spotlighted in the fantasy section over at the new website Bookiniste, a new site to help readers find books and for writers to promote their books. Thanks to the crew at Bookiniste! My 15,000-word short story "Carcass and Mallet" now has a new cover, the one above. The e-book cover should be available any time now, and the print edition will be out within the next month or so. The cover does not work all that well for an e-book, or as the front alone, but as a complete cover I think it is appropriate for what I was attempting. I was going for a bit of a 1960s surreal fantasy vibe, but updated a bit and not too surreal. Also, as can be noticed, the design formats are now the same for all my John Dee stories, and will continue to be so for any future stories; this is intentional for marketing purposes. Without reading the story (and perhaps even with reading it), the cover might not make much sense. The central pyramid figure is the resting place for Cyrus the Great, which still stands to this day in a remote part of Iran; my representation of the pyramid is not exact and is not necessarily meant to be, but is more of an iconic figure. The city in the background appears in the story, and I'll say no more about that. The little dust up on the right, with the flags and such, is actually from events in the story, a game of chogan, which is an ancient game somewhat similar to modern polo. 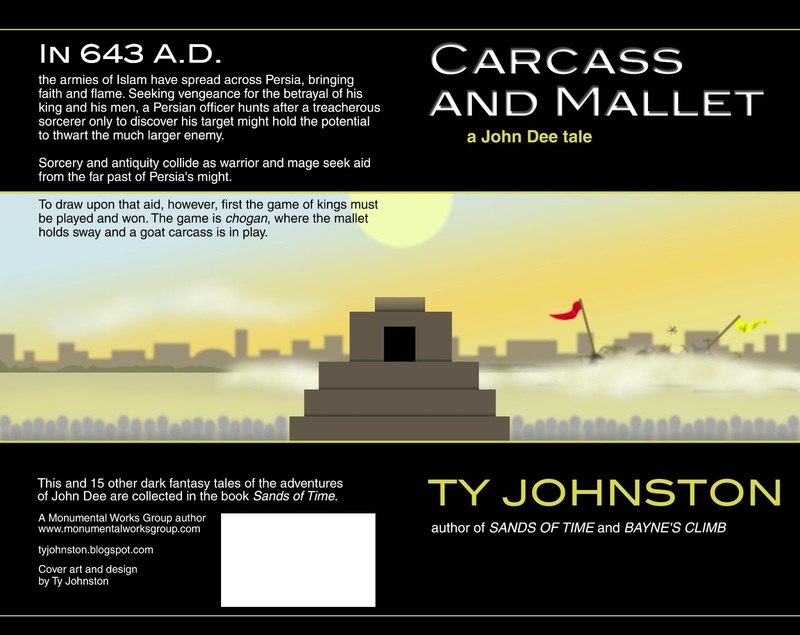 By coincidence, so far all three of the covers I've done for Dee stories have had somewhat of a desert theme. One on Mars, another in modern Iraq, and this one in 7th Century Persia. Again, that's just coincidence, and there are plenty of Dee stories that take place in other climbs (though one of them is in Vegas in 1969 ... hmm, another desert ... maybe there's something going on here). The above is the new working cover for my 5,000 word short story, "Beneath a Persian Sun." As one might guess considering this is a full cover and not just an e-book cover, yes, I'm planning to publish this one in print. It comes in right at 30 pages. 30 pages isn't a lot. 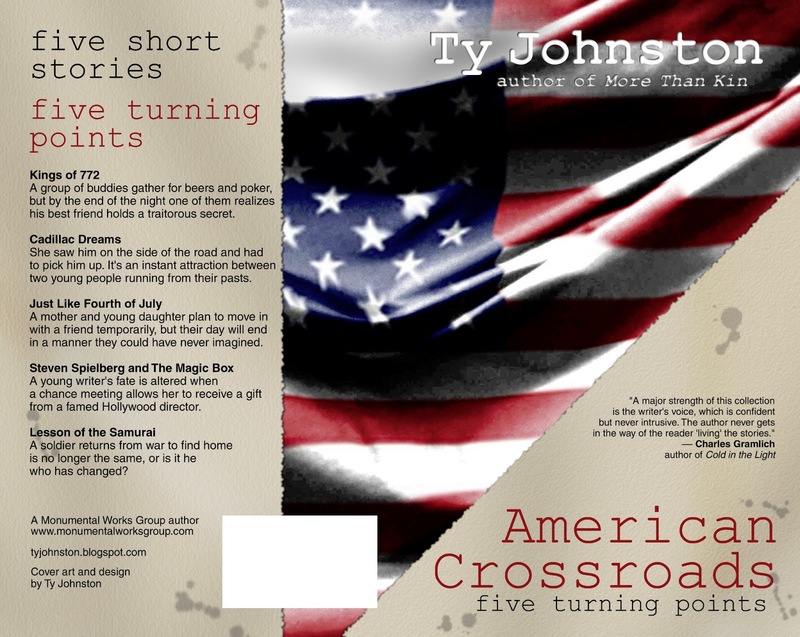 In fact, CreateSpace won't print anything less than 24 pages. Which is why I'm intrigued at giving this a try. 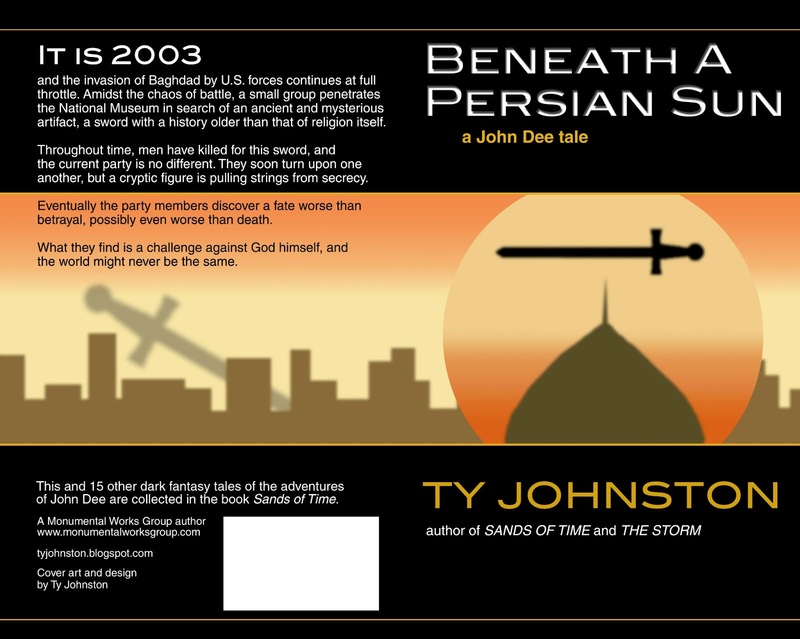 "Beneath a Persian Sun" is already available in e-book format, so why not give it a try in print? As I've stated before, I'm not publishing some of my shorts only to make money, but more as marketing tools. The appearance of these stories on Amazon alone gives me a little more publicity. Also, I can print out a handful of these shorts and give them away to friends, family, fans, and possibly at conventions and other places. I wouldn't suggest this is the best cover I've ever done, but I think it's okay, and I think it's appropriate for the subject matter. I also think it will stand out more when viewed as an icon at Amazon and other online retailers. Notes: Though I've never seen the whole thing, I have seen bits and pieces of the Brendan Fraser movie based upon this novel, and the idea of fiction characters coming to life from a book intrigued me, though I'm not sure it's all that original (seems I've read or heard of such before, but exactly where is not coming to mind). Anyway, the idea interested me enough, so now I'm off to read the novel. 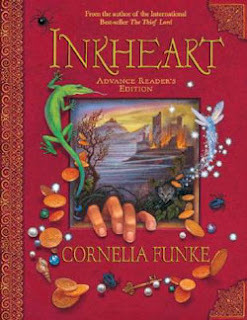 Mini review: This was just a delightful book, with a modern fairy tale sensibility about it. The tale involves a book repairer who has the power to read characters to life from books, as well as items such as treasure and the like. He doesn't know he has this power at first, and discovers it by accidentally reading some villains out of the novel Inkheart, while also accidentally reading his wife into the novel. The actual story picks up nine years later with the book doctor and his 12-year-old daughter. Enough said. I don't want to give anything away. Fans of fairy tales, children's and young adult literature, and those who have a love of books in general should go away pleased with this one. In a way, this is a young adult love story to books. The above is the new working print cover for my 10,000-word science fiction short story, "The Impulse to Punish." I'm still not decided on it, yet. With the Mars landscape artwork, I was originally trying to go for a 1960s or early '70s science fiction cover feel, but one that has been updated slightly for a modern audience. If any of that made sense. Basically, I was trying to make it look like a reprint of an old SF story. I think it will work relatively well in print, but I realize it probably won't do much as an e-book icon. Also, it's a little more austere than I originally meant it to be. At one point I had a lot more detail in the background mountains and the foreground rocks and in the desert floor, but I felt it had become far too cluttered, so I pulled back quite a bit, recognizing I would only hurt the art by going for realism. And then there are the fonts. I'm not set on the fonts. Part of my problem with these fonts and with the general design is a branding issue. For marketing purposes, I'm planning on doing at least two more short books like this one, each a short of 10,000 words or more from my series of John Dee stories. The big problem I've run into is that I need a design that can reach across genres. 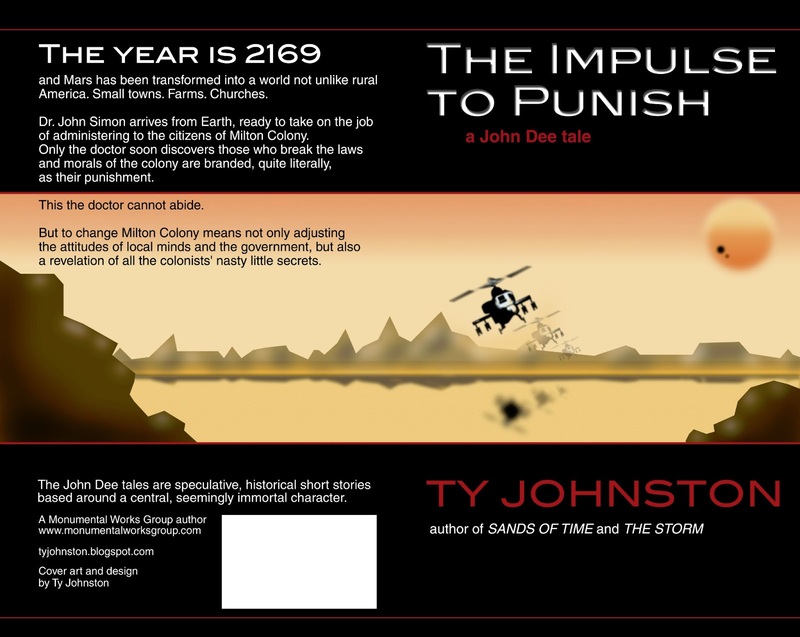 Most of my Dee stories are historical fantasy or modern horror, and within those boundaries there is a lot of room for design concepts; and then there's the fact some of my Dee stories step into other genres, such as "The Impulse to Punish," which is science fiction. So, I need a basic design that can reach across genres, though I'm willing to change some of the colors between books. I'm not set on this design, but I feel it's the best I've come up with as of yet. Still, I'm not planning to unleash this little book for at least a month, so I've got time to think about it. Opinions are more than welcome. Notes: I'm a sucker for good flash fiction, especially of a speculative nature, and especially especially when it comes from an author I enjoy. So, yeah, I'm looking forward to this one. Mini review: This is a fine little collection of flash gems that covers a wide range from fantasy to science fiction to horror to comedy and even the literary. Actually, in my opinion, the majority of these pieces are more literary than the average flash fiction tales I've read over the years, though they are not stuffy by any means. Also the comedy is sly, not goofball, and the horror is not of the gore variety. A nice addition was an epilogue of sorts in which the author outlines when he wrote each of these individual pieces, and some of his thoughts behind them. For those who love flash fiction, this one is a keeper. 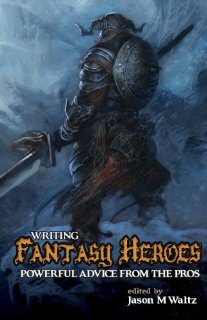 Mini review: Okay, this book should be mandatory for anyone writing or wanting to write epic fantasy, heroic fantasy, adventure fantasy, Sword & Sorcery ... whatever you want to call the various sub-genres of fantasy that tend to be action oriented. Despite the title, a number of the essays here are not strictly about the nuts and bolts of fantasy writing. Such articles are not going to inform beginners on specifics of how to write, nor how to become a bestselling fantasy author, but by following the advice within, one's craft of writing will be improved along with one's chances of becoming a bestselling author. Nor does this book outline the history of adventure fantasy literature, mainly because it should not be needed; the authors and their work presented here are themselves the history of such fiction, and fantasy readers and fans should become familiar with such work (if not already). What is here is a fairly wide range of topics, from intellectual discussion concerning heroes and heroics to what particular authors feel works or does not work within their writings (and to some extent the writings of others). The authors give examples from their own works to make their points, providing the reader with direct results of the topics discussed. Keep in mind, this is a book of advice, not necessarily a book of schooling, though there are a handful of articles pointedly about the craft of fantasy writing, with different looks at various devices that can be utilized to strengthen a story. 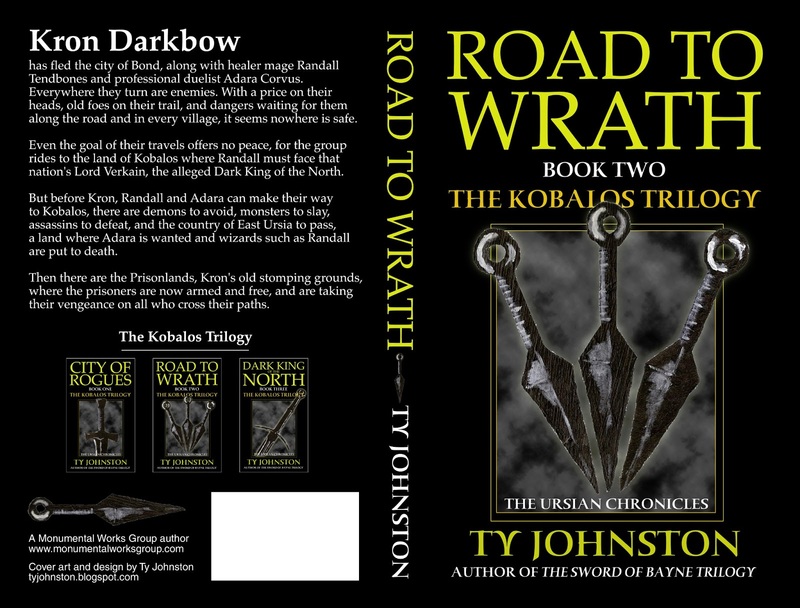 In the introduction, fantasy author Steven Erikson suggests it is "between the lines that you will find the hard truths." Erikson's words are never truer than here (and this is a man who writes of monumental truths). It was often not the main subject matter of each of these articles which enthralled me, but the underlying themes, the things not being said directly, the little idiosyncrasies of the individual authors, the way they discuss their craft seemingly from a distance while also being quite up close and personal with it. Yeah, yeah, I realize it sounds like I'm off in la-la land or something, and this is difficult for me to describe, but it was often the subtexts which interested me here, the little details, but maybe that's because I'm a writer. For beginners, this should probably not be their first book about writing, because that nuts-and-bolts stuff needs to be covered beforehand (in my opinion). But when a writer feels ready to think deeply about his or her characters, when a writer is ready to truly sink into the thematic materials of what she or he has penned, when a writer is ready to openly, blatantly and honestly discuss heroes and the heroic, this book is what should be turned to. I know it gave me a few things to think about. 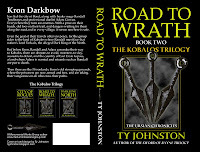 My novel Road to Wrath: Book II of The Kobalos Trilogy is now available in print, as is my novelette, The Castle of Endless Woe. And the crowds went wild! Anticipation fulfilled. Now to answer three common questions about these books that I have received of late. 1.) 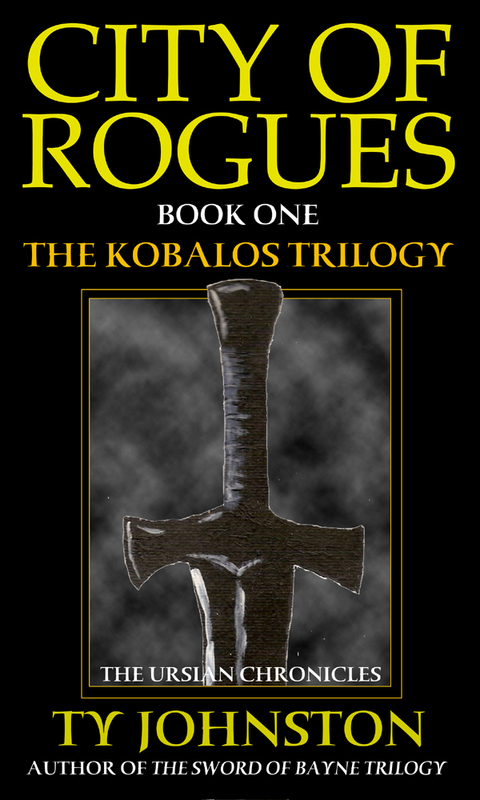 When is the last book of The Kobalos Trilogy going to be available in print? Geez, the second book just came out. Can you give a guy a moment to catch his breathe? In all seriousness, the third book will likely be available by mid-Summer, possibly even in the next month or two, depending upon my schedule. 2.) The Castle of Endless Woe is only a novelette at 15,000 words, so how can you justify doing a print version of it? Well, it depends upon what you mean by "justify?" Do you mean the price of $4.99? Sorry if that seems steep for 15,000 words, but it's as cheap as I could go and still make any profit whatsoever. The e-book edition is only $2.99, and believe it or not, I make more money from that. Print has a cost. 3.) This one I've gotten from several writers: Is it worth the time and effort to put out a print version of a novelette? It depends upon your viewpoint and your expectations. 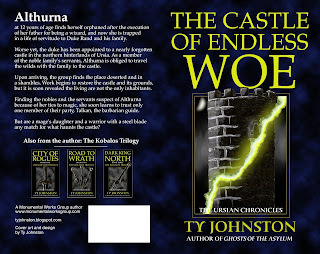 I have fairly low sales expectations for my print version of The Castle of Endless Woe, but that does not mean I consider publishing the work a waste of my time. For one thing, now the novelette will also be listed under the "Book" section at Amazon and not just the "Kindle" section, which is cheap advertising as far as I'm concerned. Immediate sales are not my only goal as I'm playing this game for the long term, and I feel having print editions helps with marketing, beyond the possible financial gains.